Turkey’s military says it has taken over the country, with soldiers at strategic points in Istanbul and jets flying low in the capital, Ankara. On Friday it had seized power but President Tayyip Erdogan vowed that the attempted coup would be put down. “We will overcome this,” Erdogan said, speaking on a video call to a mobile phone held up to the camera by an announcer on the Turkish sister station of CNN. He called on his followers to take to the streets to defend his government and said the coup plotters would pay a heavy price. Prime Minister Binali Yildirim said the elected government remained in office. However, it appeared that those behind the coup had the upper hand initially. Airports were shut, access to Internet social media sites was cut off, and troops sealed off the two bridges over the Bosphorus in Istanbul, one of which was still lit up red, white and blue in solidarity with victims of the Bastille Day truck attack in France a day earlier. Warplanes and helicopters roared over the capital Ankara. An explosion was heard in Ankara, where a helicopter opened fire. Soldiers took control of TRT state television, which announced a countrywide curfew and martial law. An announcer read a statement on the orders of the military that accused the government of eroding the democratic and secular rule of law. The country would be run by a “peace council” that would ensure the safety of the population, the statement said. TRT later went off the air. The state-run Anadolu news agency said the chief of Turkey’s military staff was among people taken “hostage” in the capital Ankara. CNN Turk also reported that hostages were being held at the military headquarters. U.S. Secretary of State John Kerry and Russian Foreign Minister Sergei Lavrov, speaking jointly after talks in Moscow, both said they hoped bloodshed would be avoided. The U.S. State Department said Americans in Turkey should shelter indoors. Other countries issued similar advice. Celebratory gunfire erupted in Syria’s capital Damascus as reports emerged that Erdogan had been toppled, and people took the streets to celebrate there and in the government-held section of the divided city of Aleppo. Turkey has been at war with Kurdish separatists, and has suffered numerous bombing and shooting attacks this year, including an attack two weeks ago by Islamists at Istanbul’s main airport that killed more than 40 people. In an earlier statement sent by email and reported on TV channels, the military said it had taken power to protect the democratic order and to maintain human rights. All of Turkey’s existing foreign relations would be maintained and the rule of law would remain the priority, it said. After serving as prime minister from 2003, Erdogan was elected president in 2014 with plans to alter the constitution to give the previously ceremonial presidency far greater executive powers. His opponents say his rule has become increasingly authoritarian. His AK Party, with roots in Islamism, has long had a strained relationship with the military and nationalists in a state that was founded on secularist principles after World War One. The military has a history of mounting coups to defend secular principles, but has not seized power directly since 1980. 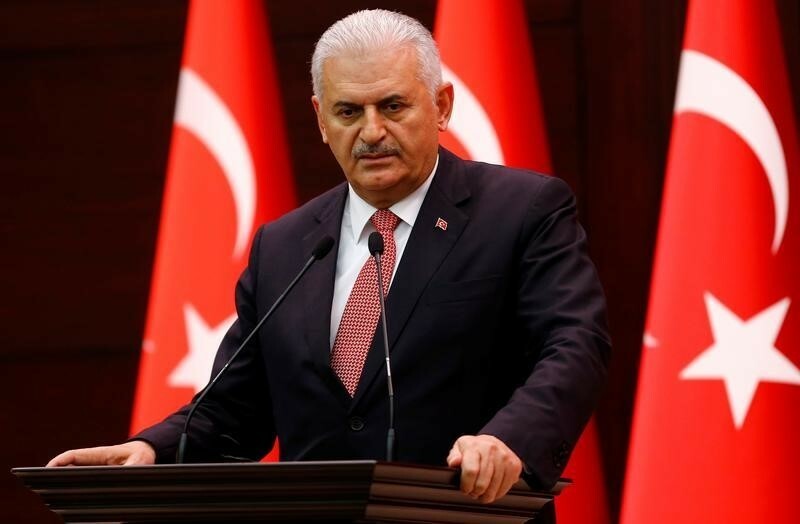 Prime Minister Yildirim said a group within Turkey’s military had attempted to overthrow the government and security forces have been called in to “do what is necessary”.